It has only been a year since I left my home in Geneva and began traveling the world in search of adventure. In that time I have visited many interesting and exciting cities with my traveling companion. I’ve talked with giant Pandas in the Berlin zoo, climbed the Eiffel Tower in Paris, tamed a Lion in Las Vegas, and eaten Sushi in Japan. On each trip, my traveling companion attends boring meetings, while I wander about the city in search of adventure. It seems pretty clear that I am having a far better time on these trips than my traveling companion. The only trip where I had to work too, was the Winter Olympics in Torino, where I was an official mascot. I had to go everywhere with my special traveling companion and perform my mascot duties. I didn’t mind though, because it meant that I was able to watch all the Olympic events and meet all the famous athletes. When I first met my traveling companion, I asked him exactly what it was he did on all his business trips. I was sure that he must see some very interesting things. He laughed, and said he was usually in conference rooms that didn’t even have windows, so there was no way to see anything at all. I thought that if he didn’t see anything interesting, the actual meetings must be exciting. These meetings might last for a day, or they might last more than a week, so I knew it must be very, very exciting. He shook his head, and told me that I would find it very boring, because they were just meetings. When I asked exactly what the meetings were like, he said a bunch of engineers would just talk about technical stuff. He tried to explain some of it to me, but before long I found myself drifting off to sleep, and I decided that he was probably right. It might be ok for him, but not for me. I was going to have real adventures. That is exactly what I have done in every city we have visited since then. I asked my traveling companion once if it bothered him that I could have excellent adventures, while he was forced to spend all his time in a meeting room. He tried to convince me that he actually wanted me to have adventures because he enjoyed hearing about the exciting things I’d been doing. It still didn’t seem fair to me, but if it was what he wanted, who was I to complain? Part of me was still bothered by it though, so this trip I decided I was going to give my traveling companion a treat. I would go to the meetings with him during the day, and then we could both go on adventures in the evening. I might not have quite as many adventures this trip, but my traveling companion would finally have some adventures of his own, instead of just hearing about mine. All I had to do was stay awake in the boring meetings he’d told me about. I was surprised when my traveling companion tried to talk me out of it. He came up with all sorts of reasons why it would be a very bad idea for me to waste my days in meetings with him. I told him that I had made up my mind, and there wasn’t anything he could do to talk me out of it. I couldn’t understand why he seemed a bit bothered by that. He should want a little company if the meetings were as boring as he claimed. The first morning we walked into the conference room, and I couldn’t believe my eyes. My traveling companion had told me that his meetings were in rooms that didn’t have windows, so you couldn’t even tell if it was night or day. This room had lots and lots of windows, and the view was fantastic. 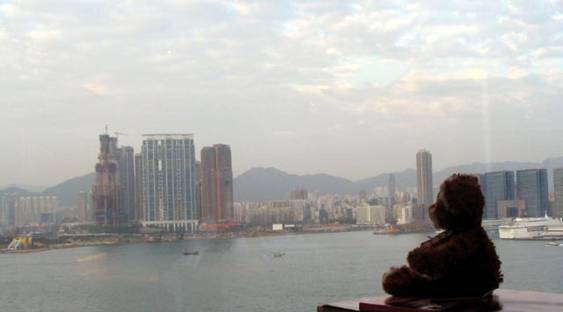 It looked out over Hong Kong harbour, with boats and planes and people enough to watch all day. I told my traveling companion that this didn’t look anything like the meeting rooms he had described to me. He tried to tell me this was the first time he had ever been in a meeting room like this. I wanted to believe him. Honestly, I really did. My traveling companion had also told me that the people in his meetings were all engineers, and that they were only interested in boring things. When I saw how wrong he had been about the windows, I decided I’d better check for myself. The first person I talked to was Franz. He is a journalist, and his hobby is steamboats. I was amazed. When I was a young bear, I loved to watch boats on Lake Geneva. I remember my grandfather telling us about the time when most of the boats on the lake were steamboats. Franz told me all about the steamboats he has seen, and why he loves them. He even has a web site about them. He also said there was a boat I should ride in Hong Kong. It isn’t powered by steam anymore, but it is a lot like the old steamboats used to be. 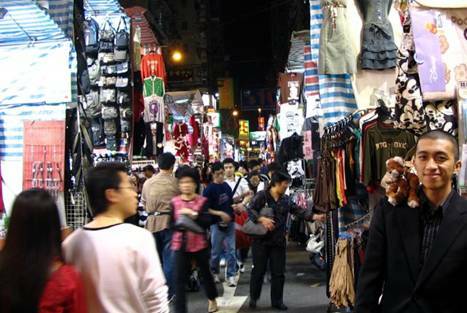 I decided right then that it was one of the things I must do in Hong Kong. When Franz had to go back to work, I decided I should listen to some of the meetings. At first I had to agree that they were a little boring, but then one of the talks changed all that. Nicholas Negroponte told us about a new laptop computer that is being made just for children. I think it’s about time! My travelling companion has a computer which I can use, but it is way too big for me, it looks ugly, and it doesn’t have any interesting games on it. But when I saw the new computer for children, I loved it. It is just my size, looks very cool, has a built in camera, connects to the Internet, and has lots of interesting games on it. I asked if it was only for people. He thought for a moment, and then said he couldn’t see any reason why it shouldn’t be for bears too, as long as they were young. Usually I can’t wait to be all grown up, but not this time. I decided that I’d seen enough of my travelling companion’s meeting, and spent the rest of the day playing with the new computer. I can’t wait till I get my own. 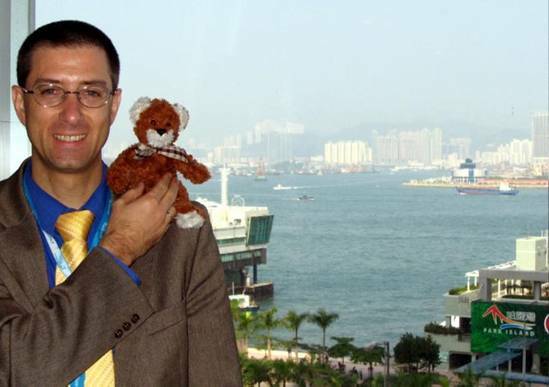 When the meeting finally ended, my traveling companion had to drag me away from the computer to go see Hong Kong. I was having so much fun playing with the new computer that I hadn’t even noticed when the meeting ended. My traveling companion insisted, and I was really glad that he did. 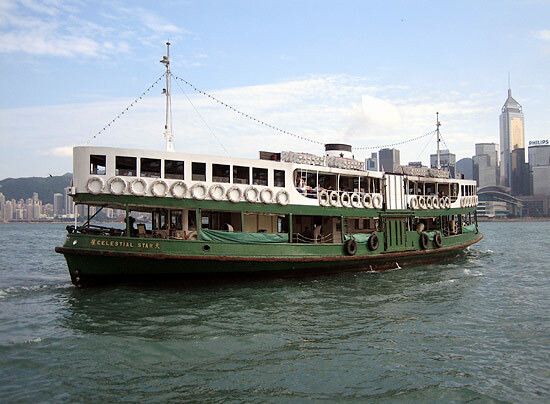 Our first adventure was to take the Star Ferry across Hong Kong harbour to Kowloon. 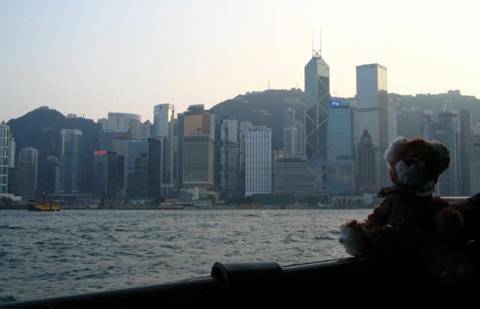 Franz had told me about it, and had said the very best views of Hong Kong are from the Star Ferry. It is absolutely true. The view was great when we took the ferry across the harbour, but when we came back, it was dark, and the view was even better. 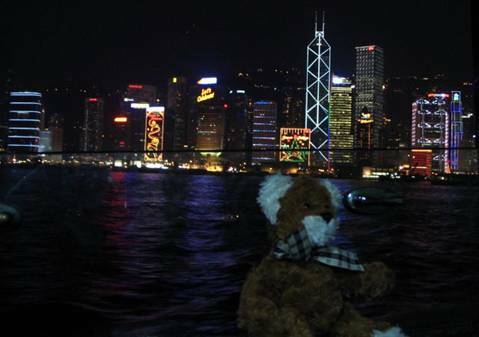 Hong Kong at night, from the Star Ferry, is something that everyone should see. 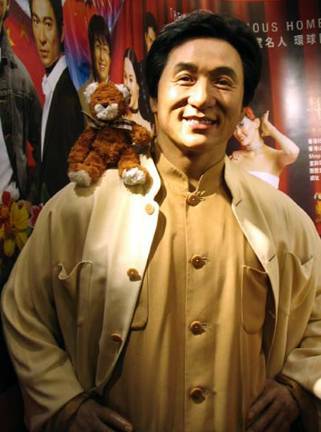 One of my favourite movie stars is Jackie Chan, so I was thrilled when I saw him later that evening. We were taking the tram up to the top of Victoria Peak, to have dinner at a restaurant overlooking Hong Kong. Jackie seemed a bit quieter than he is on his movies, but we still had a pleasant chat while waiting in line. I told him that I wanted to be a movie star some day too. He looked unsure at first, but then he had a thought. He suggested that maybe I could play the part of Godzilla in a new movie that he had heard about. The next evening, when we went out, I decided to give it a try. 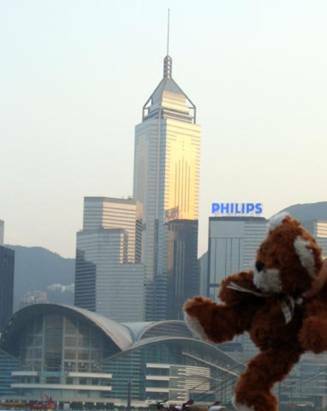 I made myself as big as I could, and tried to pretend that I was going to crush one of the buildings near the harbour. I think Jackie may be right. Wish me luck when it comes time for the auditions. Whenever I visit a new city, I love taking the subway, so I insisted that we check out the Hong Kong subway. It was very crowded, with hundreds of people jammed into the car, even though it was Saturday. I can only imagine how crowded it would be during rush hour. 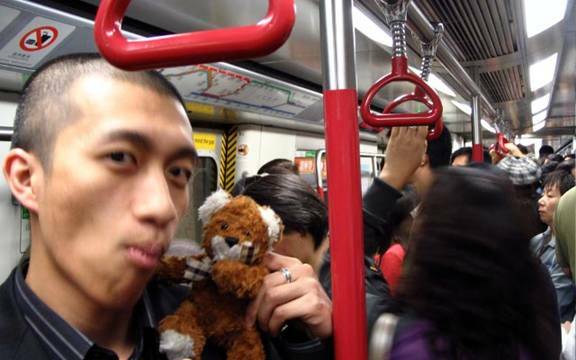 While we were crammed into the subway car, someone came up to my traveling companion from behind. I thought he was a pick pocket, so I instantly attacked. I was just about to wrestle him to the ground, when my traveling companion stopped me, and said that Henry was a friend. Henry claimed he was just trying to sneak up on my travelling companion to surprise him. He’ll know better than to try that again when I’m around. Henry seemed a bit annoyed at first, but I said I was sorry, and explained that I was just protecting my traveling companion. I told him that for the rest of the week, I would protect him too. He smiled, we shook hands, and all was forgiven. By the end of the evening we were best friends. We went to see all sorts of interesting sights that night. The first stop was an outdoor market. I was amazed at all the things that were on sale. There were clothes, blankets, towels, cameras, and watches. They even had sinks and bathtubs in one of the stalls on the street. I think that you could get anything that you wanted there. Henry gave me a personal tour of it all, and I kept guard. 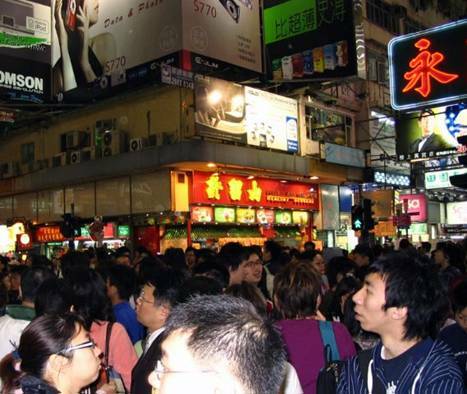 There were an amazing number of people on the streets, even though it was late at night. One time we got separated, and the crowds were carrying us farther and farther apart. I had to jump up with all my might to get high enough to see Henry and my traveling companion. If you look very closely, you can just see me. I didn’t think that Christmas was celebrated in China, so I was rather surprised to see all the Christmas decorations. There were Christmas Trees, lights and decorations everywhere we went. The weather felt just like summer, which made it even stranger to see all the Christmas things. 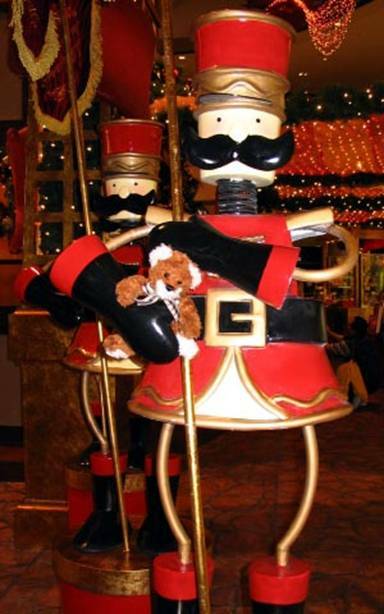 I enjoyed most of it, but when I wasn’t looking, one of the nutcracker soldiers grabbed me. He had me tucked tightly under his arm before I had a chance to protect myself. Fortunately Henry was nearby, and he rescued me. I was supposed to be protecting him. Oh well. Before I knew it, our short trip to Hong Kong was over. While my traveling companion packed, I sat by the window, looking over the harbour and thinking about my latest excellent adventure.